Markula Devi or Mrikula Devi Temple in Lahaul Valley is dedicated to goddess Kali and was constructed in 11th century AD. 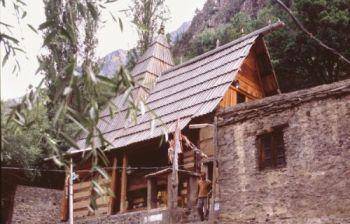 Temple is made out of wood & stones and is a perfect example of Himachili architecture. The temple is also rich with Kashmiri art work and has some beautifully carved walls and ceilings to admire. Historical scenes from the period of Ramayana and Mahabharata are depicted on the walls of the temple.